Thank you so much for your quick response. Here is what the fungus looks like. On closer inspection, I do see a bit of yellow/orangeish colouring, but I believe that to be ‘weathering’ rather the colour of the fungus. I adore my wisteria. She has been in my care for 15 years and she is my companion in peace and beauty. Thank you. 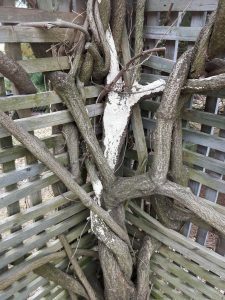 Thank you for contacting the Toronto Master Gardeners concerning your Wisteria. You have certainly presented us with a perplexing problem. Unfortunately, your image is not close enough to visualize the fruiting body of what could be affecting your vine. From all of my research it appears that your vine is not suffering from any of the usual suspects that normally affect Wisteria. I did happen to observe from your “other view” post that the area affected appears to be moist (pergola in the area appears to be covered in moss). This environmental clue leads me to suspect that what you are seeing is Slime Mould. I found the following excerpt from the University of Kentucky on slime mould and how to treat it. “Slime molds are amoeba‐like organisms which feed on bacteria and yeasts in the soil. During cloudy, humid weather these molds grow out of the soil and creep onto whatever is available. While slime molds frequently cause considerable concern among growers and homeowners, these fungi do not feed on plant tissue. Slime molds merely use low lying vegetation and other objects as support during their reproductive stage. Some damage may occur, however, when the fungal growth is heavy causing the shaded plant parts to turn yellow. You may wish to call a certified arborist to take a closer look. To find a certified professional arborist to help you with a tree problem, visit the Ontario branch of the International Society of Arboriculture here.